Since Monday, nothing new. Book is ready to go out, just pushing through the paperwork with the printer. I’ve also ordered proofs on the certificate and mug. Honestly, I may have everything ready to go out before the end of October. Yay! And again: Many of you have already told me that you missed the Kickstarter, and others that they wanted different combinations of goods, and you want to still get it. Well, I’ve opened up a stripped-down temporary store PURELY for pre-sales between now and when the book is shipped. For books #1 & #2 I have only added them as “doodled” versions. Glasses and certificates will be pulled in about a week when I put in the order to the printers (I won’t be printing extras of those). If you wish the straight-up books, please visit my TopatoCo page. Visit the “Book #3 store HERE. Not much new. Barnes/Ambaum have some “library ranger” patches Kickstarting for the librarian in your life. I had a tiny cavity filled, which hurt like hell (not usually the case). Have begun in earnest the writing of the Spacetrawler 3-month additional story. Fun! And, in case you haven’t seen it, Star Wars in 60 seconds tells you the whole story. Dmitri gonna have cute green babies? Two lessons to be learned here. One: don’t drink and bang. Two: always double-check the approxiscan to make sure you’re not too compatible. Well, he was bound to knock up SOMETHING, and we knew the Eebs were genetically compatible with humans. Coming eventually: SON OF SPACETRAWLER!!! Or maybe daughter. I haven’t heard of any “Daughter of” movies. Is Red-9 in her own bathroom? The toilet seems a bit tall for an Eeb. Urk *hurls in toilet* sh!# there’s my dinner… Well… we all kinda knew this was gonna happen sooner or later right? How is she supposed to look after an unclamped eeb baby? I usually don’t like high fantasy. Too often it is “I met the king while grocery shopping, we had tea and conquered some foreigners,” or “peasants rejoice as princess finally gets laid; futures market crashes as pleased fertility goddess promises bountiful harvest.” The idea that a handful of ordinary people out of nowhere routinely rewrite the rules of their realm is preposterous, yet that is what adventure stories tend to devolve into as stakes keep getting one-upped. And it is so much more than the genre-typical action hero protagonists following the main plot thwarting some manichaean evil scheme, where everything important in the galaxy keeps happening to the same handful of people. It has more side-plots and failed schemes and characters than I can recall off the top of my head, none of them pointless. Truly an epic for the ages. While I usually prefer science fiction to fantasy, this is one of the few exceptions, and I look forward to reading it again (if I can keep myself from calculating the decaying orbit of Martina’s casket long enough to suspend my disbelieve). ? Hollywood has turned webcomics into movies before (Cowboys and Aliens (before the second book was finished even), and one about a pilgrim). 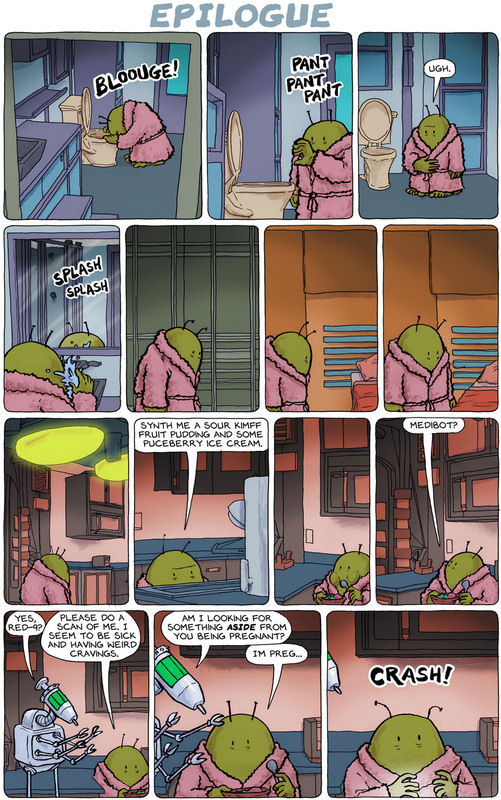 Spacetrawler deserves such recognition at least as much. Also, this strip needs a Red-9 tag. Okay, so I get that this might be (probably is) Dimitri’s. But I don’t get the question of whether the baby Eeb would be born unclamped. Wouldn’t *any* baby Eeb be born unclamped? Or are all of the remaining surviving Eebs supposed to be infertile as well? Did I miss something? Yep. Sorry to break the news but, no more beer for you Red-9. @CompaniaHill, one of the things Dimitri did on Carpsellon was to muck about with the eeb DNA to remove the telekinesis gene, so clamping of future generations would be unnecessary. I believe he even gave Red-9 the treatment (before giving her the treatment, so to speak) so that this human-eeb hybrid won’t be telekinetic. An unclamped Eeb baby, being stewed in alcohol every day since its been conceived. Also, good job with the portrayal. I believe I owe you a promotional piece for the books. >>>An unclamped Eeb baby, being stewed in alcohol every day since its been conceived. Human embryos have been stewed in alcohol from the evening before conception through weaning for generations. Then there's teething. A non-issue overwritten by PC media hype. “Pregnant.” Now how did that happen? No really, how? Checked out the “Telekinetic Removal” flashback. What’s the “skin color tweak” mentioned? @ TB – I guess it’s so they offspring of a fleshy pink and a pea green is either pea green or pea green – my money is on pea green. will we get to meet the pan-universal geniouses? I just noticed…in a place with potty-bots, medi-bots, and star drives, toilets still have porcelain tanks with gravity feed and flapper valves? @TB, in one of the first episodes a throwaway frame showed Krep explaining to Yuri how pottybots were used when you couldn’t leave your station or post. IOW, gravity-feed toilets would still be the norm in living quarters. Well, this is one fine yarn You have spun here. You made me lough and feel sad, sometimes in the space of two pages. I’m really interested in where You’re going with this now. Chapeau to You, good sir.